The 17-Mile Drive on the Monterey Peninsula in California is one of the most scenic short drives on our planet. It encompasses a variety of highlights. This gnarled, twisted tree sits in solitude on a rocky perch. Two centuries of strong ocean winds shaped it. The endearing Lonely Cypress has become the icon of the 17-Mile Drive and has been captured in countless paintings and photos (including the one above). 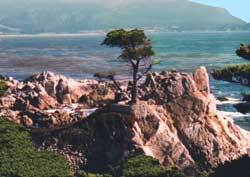 The Lonely Cypress is but one of many photogenic scenes along the coastal part of the 17-Mile Drive. These include the blue-green ocean and the white-sand cove beaches framed by rugged rock outcroppings and gorgeous tree groves. And, there's Bird Rock teeming with birds, seals and sea lions. It is generally regarded as the world's most stunning golf course. The Pebble Beach links dramatically skirt the rocky shoreline. Nearby are its three celebrated sister courses: Spyglass Hill, The Links of Spanish Bay, and Poppy Hills. All have lofty green fees, but enjoying their landscaped beauty from a distance is free. The road passes through quiet Del Monte Forest punctuated with luxurious villas and mansions.